IMPORTANT - Restrictions on use NO TRAINING. Park out of sight as this area is an SSSI . Close all gates and do not block the track.No dogs onto the site or fellsides. ( The "driveable" track has not seen much use in recent years and it is likely that it is longer possible to top drive this site). A popular site with all grades of pilot with easy top landing areas and a relatively large bottom landing area. 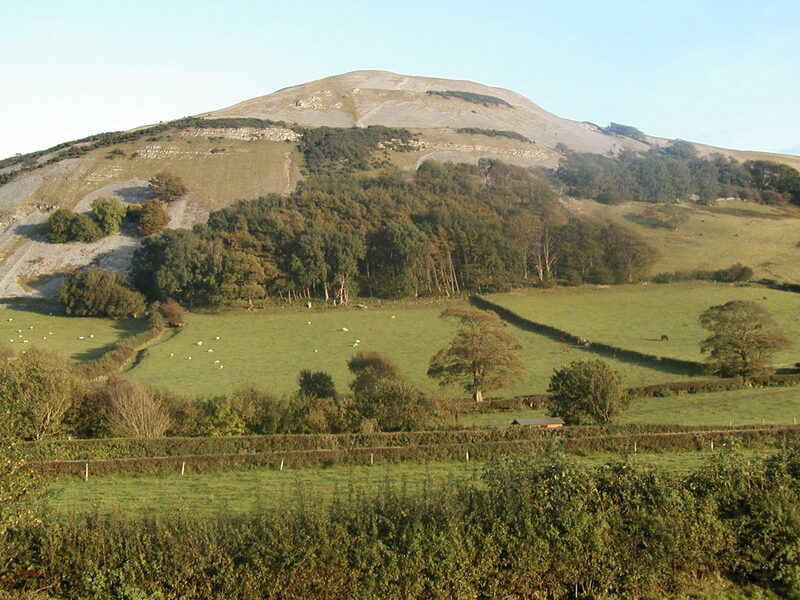 The site has an extensive west face and a shorter but often thermic NNW face. The CSC "Windsock" system operates at this site; the windsock being held at Farleton House Farm. Recent activity with pilots flying speed wings, have raised concerns about stock disturbance and upsetting our agreement with the farmer of the bottom landing field. I would like to remind all that it is good practice to pay a courtesy visit particularly if it is known that it is unlikely to make the agreed landing field. We rely heavily on the goodwill of farmers and it would be a real pity if the inaction of a few spoil it for the rest. The normal parking area is on the A6070 on the bank on the west side of the road near the landing field. Better parking options are on the minor Milnthorpe road, 0.2 mile north of the landing field. Go over the canal bridge where there is plenty of parking space. An alternative, eastern parking area can be used. From the A6070 at the Milnthorpe side road follow a minor road east through Farleton village to a narrow road bearing right. This leads to a gate onto the open fell. It is possible to park here. It used to be possible for brave HG pilots to drive up a track to the top of the hill if it was dry. This track is now severely overgrown and impassable for vehicles. From the west side. 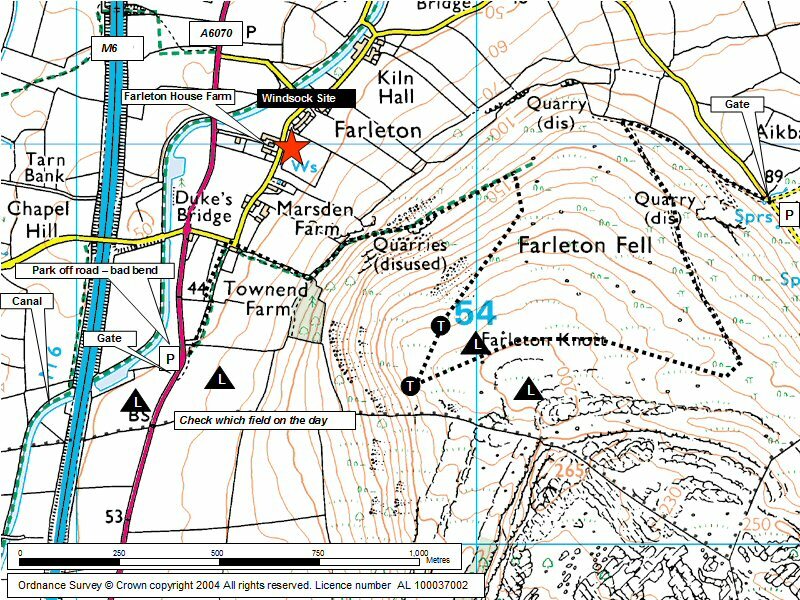 From the crossroads walk directly east on the Farleton road until it bends sharply to the left. Follow the path past the side of the white house and follow the south side of a fence going east up the hill. On the edge of small wood turn left and over a dilapidated stile. DO NOT ascend the front scree covered face of the hill as erosion is a local concern A saner choice is to follow the path that bears NE alongside the hedge. This steadily gains height until it turns to the east and fights its way through gorse bushes. Once you emerge out of the gorse turn turn South or SSE and find your way to the top of the hill on ill defined paths. From eastern car park, follow the track for 230m then up the hillside bearing slightly right. Several footpaths exist. Dallam Tower Estates for access to the hill top. Bottom landing field: Farleton House Farm, Farleton. Please obtain the CSC windsock for the bottom landing field from here. (CHECK which field is to be designated as a landing field - during MAY/JULY the 'normal' landing field is out of bounds due to silage cutting). NOTAM advised midweek. 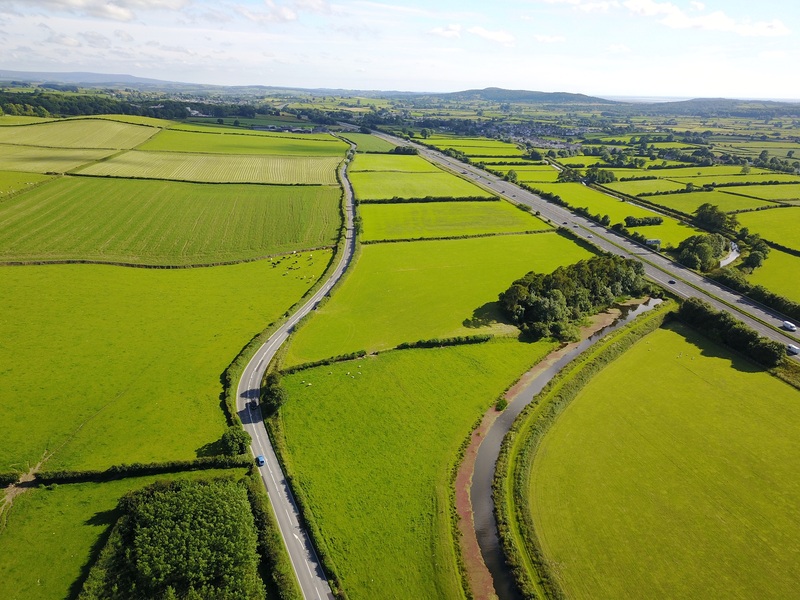 Occasional light aircraft and military jets follow the M6 using the RH rule. Beware of compression and be vigilant for any increase in wind speed that may make penetrating on a PG difficult. Public telephone in Farleton village. No real vices but take care at take off and during top landings due to compression. The wind can sometimes become quite fresh over a short period of time. As for paragliding. No known vices. 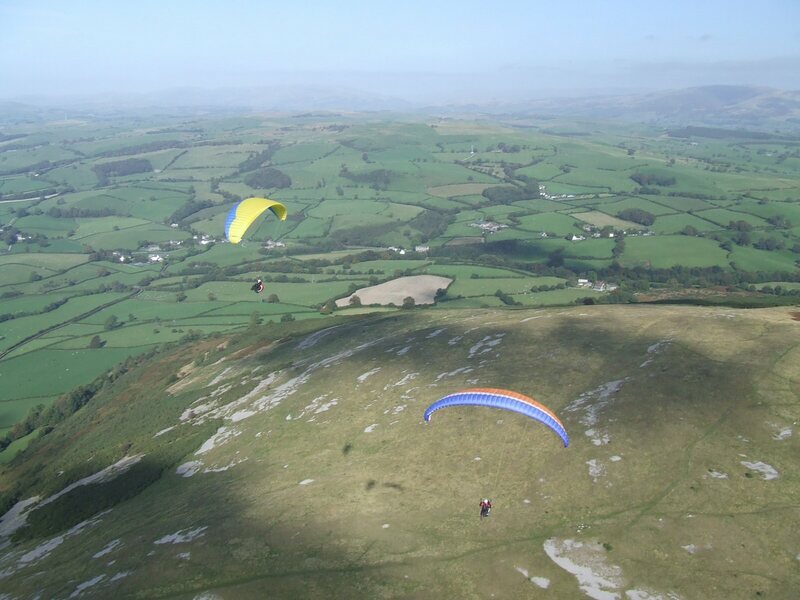 Easy top landing when flying the west face, however a little more thought is required when flying the NNW face as space is limited and the slope is not as steep. Good, unless the sea breeze sets in which it does regularly. This often spoils, what would otherwise be, a good day. 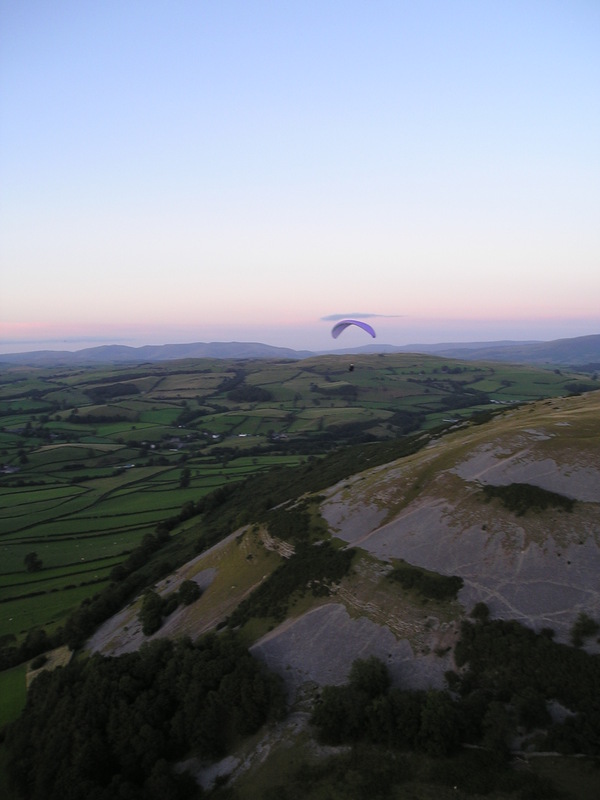 A glorious evening's flying on Farleton Knott. Looking north with take off in the middle right of the picture; one of the few green bits. Photo by Simon Raven. Google Street View - Parking We normally park off the road on the right. You need to be completely off the road as vehicles come down the hill very quickly. A better place is 0.2 miles further north where a turn left over a canal bridge leads to a much better parking place.